Last week, we learned that aging Hollywood actor Harrison Ford suffered a broken leg—and had to undergo surgery—following a mishap on the set of "Star Wars: Episode VII." The news came as a bit of a shock to fans, as it was initially reported that Ford had merely injured his ankle. You might be asking yourself: What does this mean for 2016? Ford’s injury, therefore, raises some serious questions about Clinton’s fitness to serve in the White House. 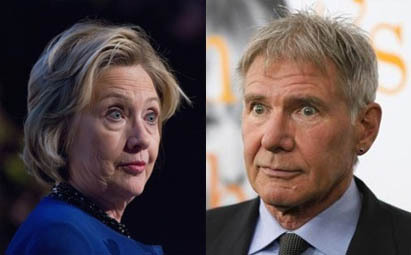 If Harrison Ford, at his advanced age, is unable to complete a relatively mundane task—pretending to be a roguish intergalactic smuggler—without injuring himself, shouldn’t voters be concerned about whether Hillary is fit to endure the rigors of the presidency, especially when there’s already so much we don’t know about her physical condition? The answer is obviously yes. As it turns out, there’s a lot that Harrison Ford’s acting career can teach us about the dangers of electing a mobility-challenged senior citizen to the highest office in the land. More importantly, we should consider the taxpayer cost of accommodating an elderly commander-in-chief who may be insufficiently mobile and/or susceptible to injury. 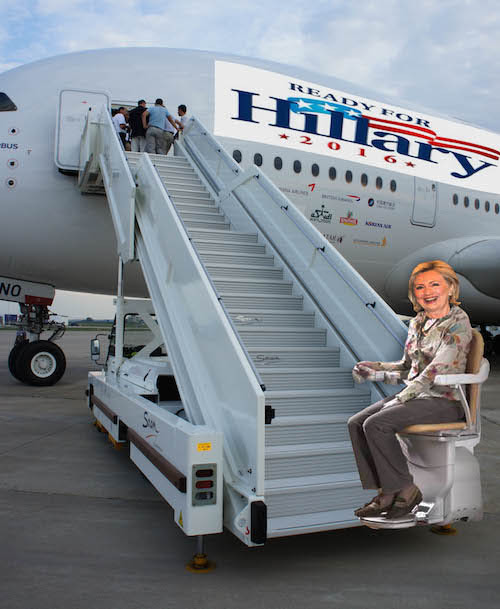 Just imagine all the staircases that would need to be outfitted with a chairlift, all the moving sidewalks that would need to be deployed on presidential excursions, not to mention the sophisticated exoskeleton/biomechanical pantsuit that may ultimately be required. Ready for Hillary, in more ways than one. Maybe Harrison Ford's injury was an unfortunate mishap. Or maybe these things are bound to happen to aging celebrities who just don't know when to call it quits. Either way, it should be a wake up call for every American. Full disclosure: The Washington Free Beacon is an anti-Clinton website. * Let's face it, two years is not a significant age difference between seniors. At that age, years are the equivalent of months, if not weeks. Could you tell the difference between a 69-year-old glass of scotch, and a 71-year-old glass of scotch? Didn't think so. This entry was posted in Politics and tagged Hillary Clinton, Hollywood, Movies, Parody, Ready for Hillary, Satire, White House. Bookmark the permalink.